If you need to use alternative flours to avoid gluten due to Celiac or a gluten sensitivity, give chickpea flour a try. This naturally gluten-free flour is made from garbanzo beans, is very high in protein and fiber, and has a nutty taste that works well in many recipes. Bob's Red Mill - Bob's Red Mill offers stone ground garbanzo bean flour along with substitution tips. Ajika Besan - Ajika Besan offers a less expensive version of ground chickpeas. Farina - This is a light, golden blend of chickpea flour ground in Italy. Bazar of India - The packaging from Bazar of India will help keep their flour fresh longer. It ships directly from California. You can easily make your own chickpea flour at home with a blender. Measure out the amount of dried chickpeas you want to grind. Place in a blender and blend on high until a fine powder forms. Sift through the powder and place the larger pieces back into the blender to grind again. Tip: For extra depth of flavor, toast the dry chickpeas first by placing them in an oven heated to 375 degrees for approximately 10 minutes before grinding. 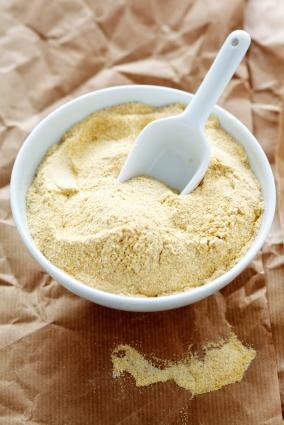 Chickpea flour can be substituted one-for-one with wheat flour when using it for breading or thickening purposes. If you bake with it, use 7/8 as much chickpea flour as the recipe calls for wheat flour. Because chickpea flour is so dense, using more than this could overwhelm your baked goods. Cutting the chickpea flour with a blend of starches and other, lighter flours is a great way to produce a lighter, fluffier bread or thinner cracker. Because chickpeas are naturally gluten-free, they lack the protein that helps to bind baked goods together. If using chickpea flour in breads or dough, make sure to add a binder like xanthan gum or a gum substitute to help keep your final product from falling apart. Use it as a breading for salmon or chicken before baking or frying. Use it to give additional flavor to brown rice bread. Make savory pancakes or crepes from it. Add it as a thickener to gravy. Add it to pizza dough. Chickpea flour can make a thick, crispy cracker with a nutty taste. 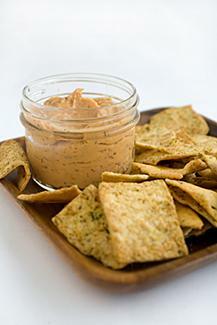 These crackers can work well with sesame seeds, rosemary, smoked paprika, or other additives. Slowly add the water until the mixture is completely moistened. Roll out to 1/8-inch thickness. Use a pizza cutter to cut into desired cracker size. Prick each cracker with toothpick in the center. Transfer the crackers onto a greased baking sheet. Bake at 350 degrees for 15 to 20 minutes or until crisp. Top with additional seasoning or salt if desired. Chickpea flour has a rich taste not found in other gluten-free flours. Try adding some to your favorite recipes and help the flavors come alive.